Two hundred and one years ago on February 27, 1813 Pearly Gates died of wounds received in an War of 1812 battle. He was 46 years old. Pearly Gates is a Robinson family ancestor. He was born about 1767 and lived in Rushville, New York. He is my wife’s Cheryl A.Robinson 4th great-grandfather and my son Eli’s 5th. The most likely engagement in which Pearly Gates suffered his fatal wounds was the British victory in the February 22, 1813 Battle of Ogdensburg, New York. Ogdensburg is 193 miles (311 kilometers) northeast of Rushville. Pearly Gates probably served in a militia unit. 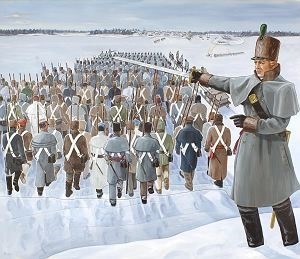 Lt. Col. George MacDonnell directing the British assault on Ogdensburg, New York. From the display at Fort Wellington, Canada where the assault on Ogdensburg was staged. Fair use of image © Parks Canada. The 250 defeated American regular and militia troops suffered 20 killed, 6 wounded, and 70 captured. Many of the captured were wounded. In all wars prior to the discovery of antibiotics, death from complications of wounds were extremely high. Wounded soldiers were also at much higher risk of dying from disease. 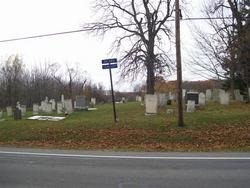 Baldwins Corner Cemetery, Rushville, Ontario County, New York where Pearly Gates is buried. Orpha (Scott) Gates, wife of Pearly, lived until she was 97. She was born on November 10, 1767 in Waterbury, Connecticut and died on July 19, 1864 in Rushville. Ophra and Pearly had at least one child, a son Enoch from whom the Robinsons are descended. 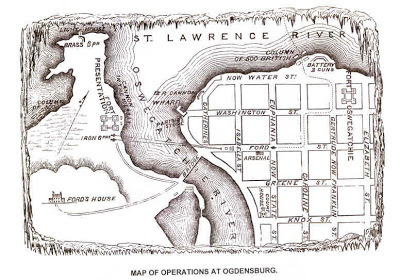 Map of Ogdensburg during the War of 1812 from Benjamin Lossing’s Field Book of the War of 1812. Public Domain image from: The North Country’s Forgotten War of 1812 General, February 15, 2012, The New York State History Blog. This is a continuation of the family research that Delia (Hobart) Robinson, Pearly’s 3rd great-granddaughter. and the mother of my late father-in-law Ralph E. Robinson. Marjorie Robinson, my mother-in-law, shared a copy of the reply Delia had received in 1972 from the Town of Gorham (Ontario County, New York) Historian. That letter contained references to family oral history regarding Pearly Gates. I did not find Pearly Gates in any of the online digitized War of 1812 documents nor did I find record of a widow’s pension for Orpha. I plan to do further research. The documentary history of the campaign on the Niagara frontier by E. A. Cruikshank. Fort Wellington, Canada where the assault on Ogdensburg was staged. This entry was posted on September 18, 2014 at 11:22 pm and is filed under Robinson Family History. You can follow any responses to this entry through the RSS 2.0 feed. You can leave a response, or trackback from your own site. I would be very interested in corresponding with you. I am working on an article for the Town of Gorham Historical Society about Gates Tavern which Orpha and Pearley started. I will reply in an email. Thanks for interest and your visit to my blog.